What do Barack Obama, Thomas Jefferson, George W. Bush and the other past U.S. presidents have in common? 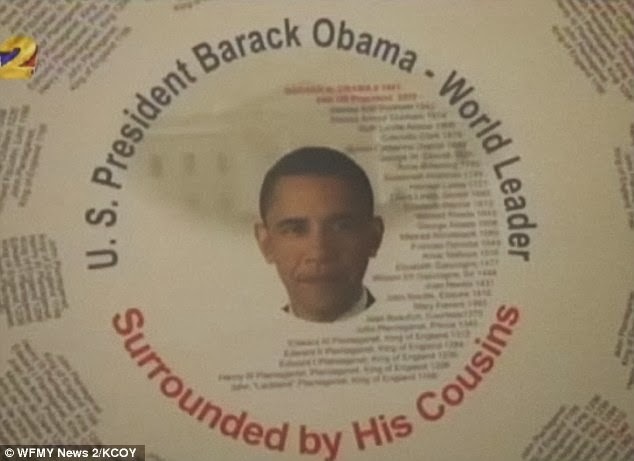 Besides holding the coveted title of commander-in-chief, it appears that all of them but one are cousins. 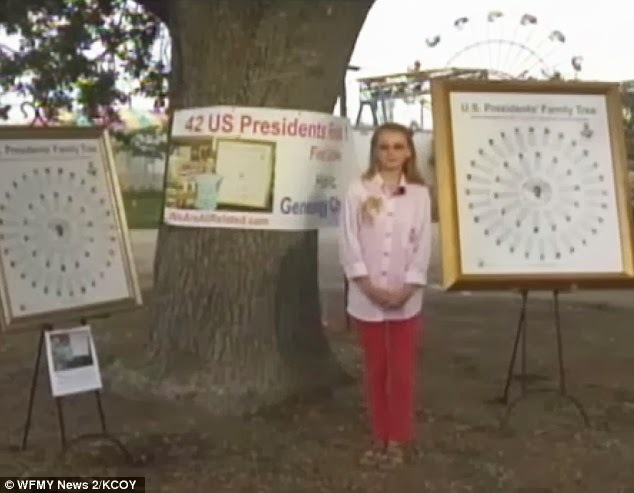 The remarkable discovery was made by 12-year-old BridgeAnne d’Avignon, of Salinas, California, who created a ground-breaking family tree that connected 42 of 43 U.S. presidents to one common, and rather unexpected, ancestor: King John of England. ‘They all have the trait of wanting power,’ d’Avignon told the station WFMY. 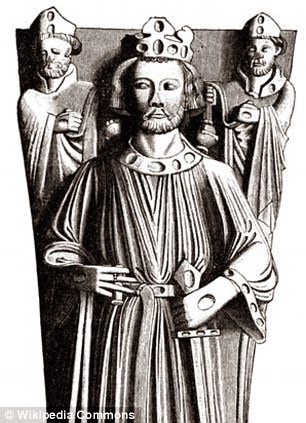 King John, also known as John ‘Lackland’, is renowned for signing the Magna Carta in 1215, which limited the monarch’s power and helped form the British Parliament. John’s other claim to fame, or infamy, is that he was depicted as the villain in the Robin Hood tales. D’Avignon, a seventh-grader at Monte Vista Christian School in Watsonville, started the project in hopes of tracing back her own bloodline in France, but somewhere along the way she decided to take her genealogical quest to the highest level. Her 80-year-old grandfather, who has been tracing roots for nearly six decades, helped her make the presidential links. D’Avignon started with the first U.S. president, George Washington, she traced both the male and female family lines to make the connection. Prior to d’Avignon’s discovery, genealogists were only able to link 22 families of presidents, likely because they only focused on male bloodlines. 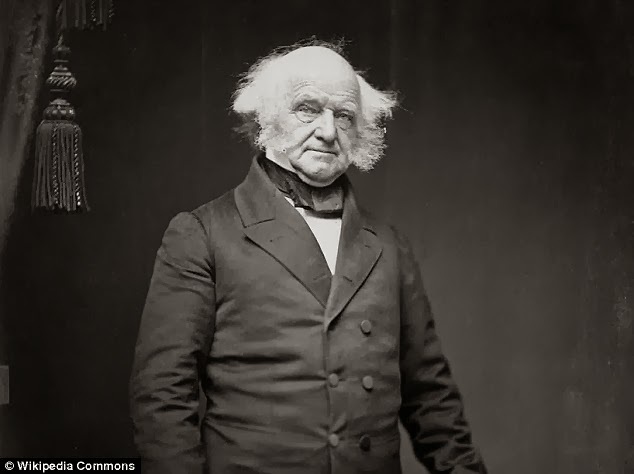 The only former commander-in-chief not linked to King John is the eighth president, Martin Van Buren, who had Dutch roots. The teen also found out that she is the 18th cousin of President Obama. She even wrote to her new-found relative a letter to share her findings with him. So far, however, d’Avignon said she received only a generic response from the White House. D’Avignon created a poster of the presidential family tree and is selling signed copies of it in hopes of raising enough money to make a trip to Washington DC. 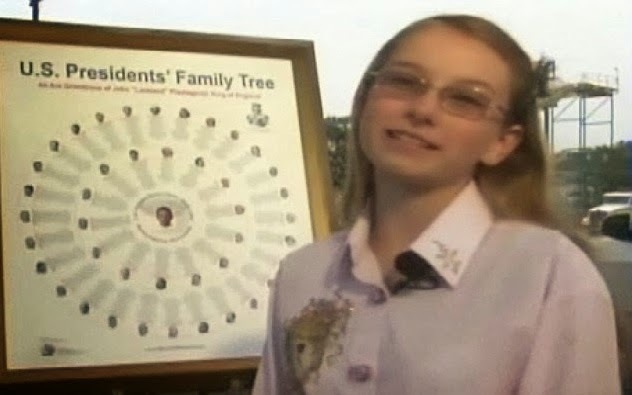 The middle-school student says her goal is to hand-deliver a replica of her family tree to the president. 'I think we just all go back somewhere; it’s just a matter of proving it,' she said.